You are currently on: Undergraduate Targeted Admission Schemes (UTAS) page. Open sub navigation overlay. UTAS is the University’s Undergraduate Targeted Admission Schemes for eligible Māori and applicants from some equity groups. UTAS reserves a number of places in our undergraduate programmes for applicants who have met the University Entrance (UE) standard but have not met the guaranteed entry score for the programme of their choice. UTAS students are expected to meet the same high academic standards as all other undergraduate students at the University. Applicants who have themselves or whose parents/primary guardian(s) have been granted refuge in New Zealand. * UTAS applicants from low socio-economic backgrounds must be school leavers. 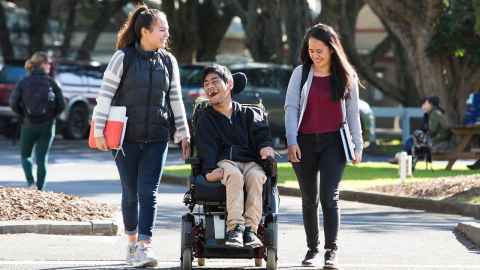 UTAS students, Manuele Teofilo and Dexter Rapana, share their journeys at the University of Auckland in the UTAS student profiles. How do I apply for UTAS? Applicants who wish to be considered under UTAS must indicate/tick the appropriate box on their online application for admission form. Additional information could be required by some programmes. It is recommended that even if you do not wish to apply under a UTAS scheme that you tick the box/es that are applicable to you. See UTAS admission requirements below. 2020 Undergraduate Targeted Admission Scheme. Size: 117.9 kB. Type: PDF. Download this PDF file. Size: 117.9 kB. To find a list of frequently asked questions about UTAS, visit UTAS FAQs.